Welcome to the hostel Sabrina. We are located in the historical old part of St. Petersburg. By choosing our hostel, you will find recently renovated comfort rooms with the highest standard of cleanness and wonderful morning breakfast. 5-7 minutes walk from the metro Sennaya sq. & Sadovaya. The short walk 10-15 minutes will bring you to the Isaac Cathedral, Admiralty and the State Hermitage. 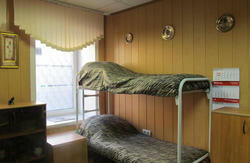 Hostel Sabrina is a cozy and extremely clean hostel offering safety and experience. We are situated on the 3 floors of a beautifully remade building dated from the 19th century. -Guest kitchen - a fully equipped kitchen with a microwave, toaster, coffer maker, refrigerator, and washing machine. 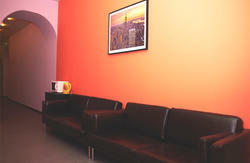 -Dining & Common areas - these two spacious rooms have the dinner tables and chairs, cable TV and stereo with CD Player. Here you can gather together with your friends or meet some new one. -Luggage storage - you can keep your luggage free and safely after your check out time. Easy transport connection, just two metro stops from the Moscow Rail station and a direct shuttle from International airport Pulkovo. -from Airport Pulkovo 2 (International)- take a direct shuttle # 3 (the stop you find from the left side of arrival hall). It will bring you directly to Sennaya square. Coming up from metro, go along Sadovaya street to the crossing with Voznesensky prospect (one block). -from Airport Pulkovo1 (Domestic airlines)- take any bus or shuttle (the stops from the right side of arrival hall) and go to the close metro station Moskovskaya. Use Blue direct line # 2 to go to Sennaya square metro station. Coming up from metro, turn to left and go along Sadovaya street to the crossing with Voznesensky prospect (one block). - -from Moskovsky Rail station (Ploshad Vosstania metro station) to Vladimirskaya. Change line to Dostoevskaya and go one more station to Spasskaya. Use exit through Sadovaya station, entrance to Chanal Griboedova. Go along Sadovaya street to the crossing with Voznesensky prospect.